TO ALL GODLY PEOPLE, In the Citie of London. Having thought it needful to warn you of the Mischiefs and Evils practiced in the Sight of God by those called Freed Masons, I say take Care lest their Ceremonies and secret Swearings take hold of you; and be wary that none cause you to err from Godliness. For this devllish Sect of Men are Meeters in secret which swear against all without ther Following. They are the Anti Christ which was to come leading Men from Fear of God. For how should Men meet in secret Places and with secret Signs taking Care that none observed them to do the Work of GOD; are not these the Ways of Evil-doers? Knowing how that God observeth privilly them that sit in Darkness they shall be smitten and the Secrets of their Hearts layed bare. Mingle not among this corrupt People lest you be found so at the World's Conflagration. In 1826, Thurlow Weed, an Anti-Jacksonist movement became (since Jackson was a Mason) the Anti-Masonic Party. This political Party ran presidential candidates in 1828 and 1832, but by 1835 the party had disbanded everywhere except Pennsylvania. In 2004,  although it was claimed by non-Labour politicians that the real reason was in order to have a Labour supporter, Malcolm Bishop, in the role. Historically, complaints have been made that the Masons have secretly plotted to create a society based on the revolutionary ideals of The Protocols of the Elders of Zion. Hitler outlawed Freemasonry partially for this reason. The covenant of the Palestinian Islamist movement Hamas claims that Freemasonry is a "secret society" founded as part of a Zionist plot to control the world. The excommunication. Since that time the punishment has been an interdict, barring the offender from Holy Communion. Although the canonical penalty changed in 1983, the prohibition on membership has not. ^ Oxford English Dictionary (1979 ed. ), p. 369. ^ Whalen, W.J., "Freemasonry" (1967)The New Catholic Encyclopedia article hosted at trosch.org. Retrieved 2011-10-19. ^ «Протоколы Сионских Мудрецов и Всемирный Жидомасонский Заговор»Кац. А. С. ^ Whalen, W.J. "Freemasonry" The New Catholic Encyclopedia (1967), hosted at David Trosch's website. Retrieved 2011-10-09. ^ Stein, Jeff (7 April 2014). "Bay of Piglets: How the Freemasons Got Caught in a Plot to Topple the Castros". ^ Paul M. Bessel (1994). "Bigotry and the Murder of Freemasonry". 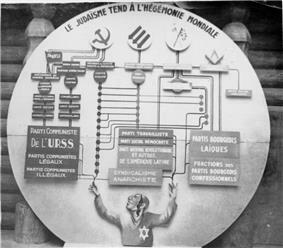 These people who attack Masonry with exaggerated language, and without accepting reasonable explanations of what Freemasonry really is, would probably say that their use of language about Masonry that is strikingly similar to that which was used by the Nazis and other vicious attackers of Freemasonry in the past does not mean that they are following in the footsteps of the Nazis. ^ The Encyclopedia of the Holocaust, volume 2, page 531, citing Katz, Jews and Freemasons in Europe. ^ Christopher Hodapp (2005). 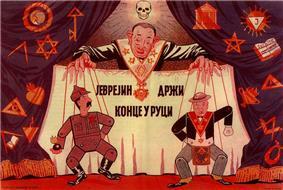 Freemasons for Dummies. Indianapolis: Wiley Publishing Inc. p. 85. , sec. "Hitler and the Nazi"
^ What is Holocaust Memorial Day? ^ "Saddam to be formally charged", The Washington Times, July 1, 2004. Retrieved 2011-10-09. ^ a b "Another characteristic of Masonic law is that "treason" and "rebellion" against civil authority are declared only political crimes, which affect the good standing of a Brother no more than heresy, and furnish no ground for a Masonic trial." 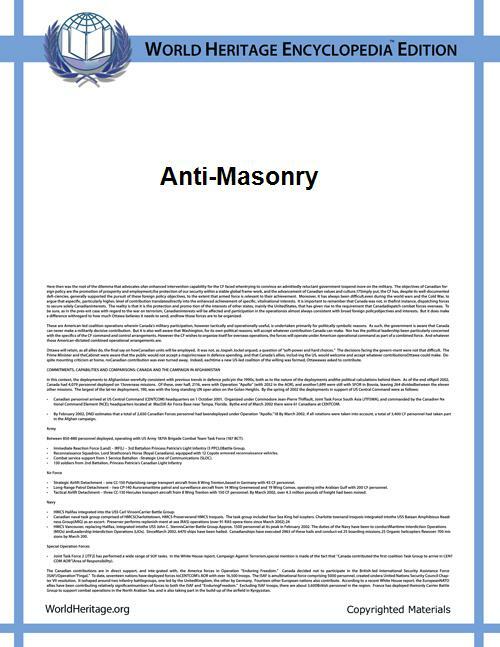 Masonry (Freemasonry) from the Catholic Encyclopedia, partially quoting Mackey, Jurisprudence, 509. ^ "2nd – You shall be true liegemen to the King of England without any treason or falsehood, and if you know of any that you amend it privily, if you may, or else warn the King and his Council of it by declaring it to his officers." ^ II. Of the CIVIL MAGISTRATES supreme and subordinate "A Mason is a peaceable Subject to the Civil Powers, wherever he resides or works, and is never to be concern'd in Plots and Conspiracies against the Peace and Welfare of the Nation, nor to behave himself undutifully to inferior Magistrates; for as Masonry hath been always injured by War, Bloodshed, and Confusion, so ancient Kings and Princes have been much dispos'd to encourage the Craftsmen, because of their Peaceableness and Loyalty, whereby they practically answer'd the Cavils of their Adversaries, and promoted the Honour of the Fraternity, who ever flourish'd in Times of Peace. So that if a Brother should be a Rebel against the State he is not to be countenanc'd in his Rebellion, however he may be pitied as an unhappy Man; and, if convicted of no other Crime though the loyal Brotherhood must and ought to disown his Rebellion, and give no Umbrage or Ground of political Jealousy to the Government for the time being; they cannot expel him from the Lodge, and his Relation to it remains indefeasible." ^ Hitler, Adolf. Mein Kampf: Volume One – A Reckoning. "[Chapter XI: Nation and Race, http://www.adolfhitler.ws/lib/books/43kampf/kampf43.htm]" 1924, trans. 1943. – "Finally, the Jewish influence on economic affairs grows with terrifying speed through the stock exchange. He becomes the owner, or at least the controller, of the national labor force. To strengthen his political position he tries to tear down the racial and civil barriers which for a time continue to restrain him at every step. To this end he fights with all the tenacity innate in him for religious tolerance-and in Freemasonry, which has succumbed to him completely, he has an excellent instrument with which to fight for his aims and put them across. The governing circles and the higher strata of the political and economic bourgeoisie are brought into his nets by the strings of Freemasonry, and never need to suspect what is happening." ^ Hitler, Adolf. Mein Kampf: Volume Two – The National Socialist Movement, "[Chapter XIII: German Alliance Policy after the War http://www.adolfhitler.ws/lib/books/43kampf/kampf43.htm]", 1924, trans. 1943. – "The fight which Fascist Italy waged against Jewry's three principal weapons, the profound reasons for which may not have been consciously understood (though I do not believe this myself) furnishes the best proof that the poison fangs of that Power which transcends all State boundaries are being drawn, even though in an indirect way. The prohibition of Freemasonry and secret societies, the suppression of the supernational Press and the definite abolition of Marxism, together with the steadily increasing consolidation of the Fascist concept of the State — all this will enable the Italian Government, in the course of some years, to advance more and more the interests of the Italian people without paying any attention to the hissing of the Jewish world-hydra." ^ 'The Covenant of the Islamic Resistance Movement (HAMAS) – Palestine', Art. XVII, XXII, and XXVIII, 18 August 1988. Retrieved 29 October 2005. ^ "Bereits um 1786, kurz zuvor waren die Illuminaten in Bayern verboten worden, kursierte das erste Pamphlet über die Freimaurer, das von einem anonymen Autor als "Enthüllungen des Systems der Weltbürger-Politik" veröffentlicht wurde." Transl. "As early as 1786, shortly before the banning of the Illuminati in Bavaria, the first pamphlet about Freemasonry arrived, the anonymously authored "Enthüllungen des Systems der Weltbürger- Politik"." Freimaurer im Wandel der Zeit- von der Gründung bis heute, from the Neue Freimaurer website. ^ Joseph Cardinal Ratzinger, Prefect. Declaration on Masonic Associations Sacred Congregation for the Doctrine of the Faith, 26 November 1983. Accessed 2011-10-09. "Therefore the Church's negative judgment in regard to Masonic association[s] remains unchanged since their principles have always been considered irreconcilable with the doctrine of the Church and therefore membership in them remains forbidden. The faithful who enrol in Masonic associations are in a state of grave sin and may not receive Holy Communion. It is not within the competence of local ecclesiastical authorities to give a judgment on the nature of Masonic associations which would imply a derogation from what has been decided above..."
^ Prescott, Andrew. The Study of Freemasonry as a New Academic Discipline (pdf). pp. 13–14. Retrieved 2006-05-21. ^ "Can a Muslim be a freemason?" (asp). Islamonline.com. Retrieved 2007-05-08. ^ Hamas Covenant of 1988. Wikisource. Accessed 2 October 2007. ^ Leyiktez, Celil. "Freemasonry in the Islamic World". Accessed 2 October 2007.